Patios created with your environment in mind allow you to build a space you can entertain friends and family or escape from all the problems of the day. You can choose from endless colors of man-made pavers or natural flag stone, we are only limited by our imagination. Entertain friends, relax, enjoy solitude with nature, and escape from the stresses- these are just a few of what patios can do. No wonder why more and more homes in Vermont look and feel incomplete without adding at least the simplest patio. Your home should soon have an extension of a living space outdoors. The patio will surely be the next favorite spot of every family member and maybe even your friends and neighbors. Patios have many great purposes. First, they can be the best space organizer. They often have minimalistic design, which allows you to move a furniture piece from there and switch it with something bulky indoors. Second, a patio adds a great feature for your home that can be turned into a barbecue spot, play area, chatting space, and many others. It can even be the focal point of your house, making your whole space a lot more welcoming to look at. Lastly, a patio increases the market value of your home. Maybe not anytime soon, but when the time comes, rest assured that your investment can be recouped. Your patio can be installed in any part of the outdoors. It can be on the front, back, or the side. But you should seriously consider the temperature, humidity, direction of the wind, seasonal changes, and other elements that surround the areas when choosing the best location of the patios. A good rule of thumb is to choose the most comfortable area. Some homeowners prefer to have the patios at the backyard because it is more private, closer to the garden, and is protected against wind. Sometimes, patios are best installed at the front especially if it will mostly be used to welcome guests while keeping the house’s indoors more private. The side of the house can be the perfect spot if it’s big enough for a decent patio or if there is no other better spot. Don’t worry about the decision-making because Rainbow Acres Landscaping will help you choose the best. Of course, the final say is still yours. We will just give you enough information so that you can objectively choose the best spot for the patio. For some ideas, please scan our Photo Gallery. It features the beautiful changes that we have helped build for some homes in Vermont. Your home will soon have the most comforting patio in town. Imagine your wanted design and we will fusion that with practicality. We believe that patios should not just be stylish but also functional. That is why we highly recommend using of patio pavers for the flooring. Patio pavers are very sturdy and elegant. They can last a lifetime and can withstand no matter how grave the weather is. Our team is composed of specialists in designing and building great patios. 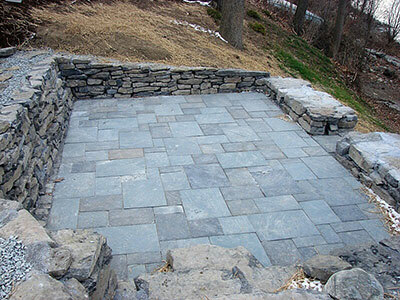 We use natural stones, concrete patio pavers, stamped concrete, and other high quality materials for creating patios. We have the right products, tools, and equipment that will enable us to complete your dream patio in no time. At Rainbow Acres Landscaping, our goal in every project is to exceed our client’s expectation. Contact us today and let us start discussing about patios.